When it comes to reading, I’d say I have quite eclectic tastes. I’m just as happy reading literary fiction as I am epic fantasy. I’ve always got time for a good thriller or crime novel and if I hear about a great new dystopian or post-apocalyptic book, I’ll buy it straight away. That said, there are a number of genres that in general, I don’t tend to read. This includes poetry, non-fiction, autobiographies and books that are too focused around war or long-drawn out battles. I’m also not a huge fan of young adult contemporaries. Of course there are exceptions to every rule. I recently read and really enjoyed When Breath Becomes Air, a memoir by neurosurgeon Paul Kalanithi. I do enjoy character driven novels set in the time period of WWI or WWII, just not those that are overly focused on the technicalities of battles. I really enjoyed Truman Capote’s In Cold Blood, which looks at a real life crime and its repercussions. I’m also hoping to explore poetry more in the future and have heard that Rupi Kaur’s Milk and Honey is a good collection to start off with. Sometimes when browsing through other book blogs, I see reviews of books or lists of new releases that sound great or that have amazing beautiful covers – even though they aren’t in a genre I usually read. I also hear a lot of hype about particular books in the blogosphere, particularly YA contemporaries, that makes me wish that I’d read something and could join in the conversation. This can sometimes tempt me in, but a part of me is still always wary of investing in something if I know there’s a high chance it won’t be for me. In the long run, I do think it’s best to understand your own likes and dislikes, and to accept that they might well be different from other peoples. There’s nothing wrong with trying to read outside of your genre every once in a while, especially if it’s something that’s been recommended to you, but I personally think I’d rather focus my time on genres that I know I’m more likely to enjoy based on past experiences. What are your views on this? Are you an adventurous reader? Do you feel sometimes feel pressured to read books that aren’t generally your go-to genre or do you know what you like and stick to it? The story: Mariko is on her way to be married to a member of the royal family when her carriage is attacked and her companions murdered. Disguised as a boy, she sets out to find and infiltrate the notorious Black Clan, defend her family’s honour and discover who wants her dead and why. At the same time, her twin brother will stop at nothing to find her again, while others are scheming away in the background to manipulate events to suit their own agendas. My thoughts: Mariko is a strong main character, and over the course of the novel she undergoes a real transformation. Disguised in a male dominated environment, the characteristics she was always taught to value above all others are useless and she has to learn from scratch the practical skills that others take for granted. As the novel progresses, she also has to come to terms with various home truths about herself and the world she was brought up in, casting off her privileges to become her own person for the first time in her life. In Susan Ee’s ‘Angelfall’, the world has come to an end. Violent armies of angels have taken over the earth, destroying anyone who stands in their way. On the ground, street gangs run the cities. Food and other supplies are scare and people are resorting to the most extreme measures to stay alive. Angel parts are valuable currency and secret resistances are building. As well as wreaking havoc on earth, the angels are also stealing young children away from their families. No-one knows where they go, but they are never seen again. Following a chance encounter with a group of angels, Penryn’s younger sister is taken. Determined to find her, no matter what the cost, all that Penryn has to go on is a fallen angel left behind after the conflict, Raffe. It was quite refreshing to have a lead character in this dystopian/YA genre that is just a normal person. Penryn isn’t ‘special’, she’s not ‘the Chosen One’ and she doesn’t develop special powers. She’s just a girl that has to adapt to extreme circumstances. There is, of course, a romantic element to the story, but for a lot of the book she relies on her own strengths and wits to stay alive and to get out of trouble. She’s not overly mollycoddled and she’s not afraid to get her hands dirty. Although the enemy here are angels, there isn’t a strong religious element. God isn’t present, he ‘talks’ through one representative. However, many of the angels seem to be agnostic and doubt whether God exists at all. They are very much a warrior tribe, and they should be seen as one. I did have a few minor issues with this book. I understand that world that Penryn and her family are living in is supposed to be a war zone. Still, I find it hard to believe that in just a few short weeks people would have resorted to cannibalism to stay alive. Penryn makes her way into the woods, which are still full of animals, relatively quickly from where she is. She also finds a stash of food in an office building at one point, suggesting that there is food to be found still. So the repeated mentions of cannibals felt like they were added in more for dramatic effect than anything else. Some of the language and descriptions were a bit overdone for my liking. At some points the dialogue didn’t seem to flow as it should, and it felt like the author was trying a little bit too hard to be witty. Plus, as with pretty much all YA books, there is the typical instant and overwhelming physical attraction to the romantic lead. That said though, it’s a pretty good effort, and I’ll probably be reading the rest of the series. After a horrific accident that destroyed Luce’s life, she lands at a reform school, which is predictably full of oddballs, misery and strict rules. But the second Luce sees fellow student Daniel, she can’t shake the feeling that she’s met him before. She’s haunted by a sense of déjà vu, and she can’t seem to stay away from him. He, on the other hand, seems to want nothing to do with her. Soon though, circumstances conspire to throw them together, and it becomes clear that the two of them have a past that goes back far longer than Luce can remember. As Luce searches for answers, the stakes continue to get higher and more dangerous at every turn. 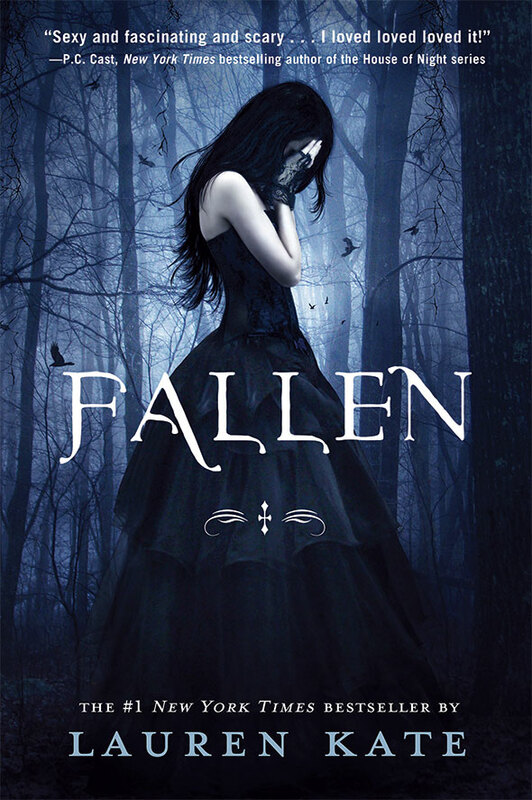 While the idea was good, there were a few inconsistencies in ‘Fallen’ that I couldn’t really get my head around. Daniel and Luce have known each other before, time and time again, that’s clear from the opening pages. But while Luce is ignorant of their past each time they meet, Daniel has the full knowledge of what’s come before. It’s no surprise then when they meet again at reform school. But Daniel is there first. And if he’s lived so many amazing lives in the past, I couldn’t help but wonder what he was doing in somewhere so miserable. The same goes for all of the other supernatural beings – and there are many! Why immortal creatures would choose to spend their time going to one of the dreariest sounding schools around, when they clearly have other, more interesting options, is beyond me.